Forgetting to ask a question during your appointment is perfectly understandable. Shock, distress, lack of sleep and distraction, by needing to attend to your child, impact upon what you can take onboard. Not knowing what to ask is also common. Please contact us to discuss your questions and we'll gladly be in touch and point you to the best source for having your questions answered. What are the other names for hip dysplasia? What does DDH stand for? DDH is short for developmental dysplasia of the hip. As this condition is mostly treated during infancy and childhood, and is developmental in nature, this is the most commonly used name for the condition. What are the risk factors for hip dysplasia? Why is it so hard to diagnose? A silent condition (sometimes there are no obvious signs or symptoms), it’s exact cause(s) aren’t fully known, complicating diagnosis further. It is a developmental condition which might not be present at birth but can present at some stage during childhood, usually up until proficient walking is achieved. My child requires more treatment for DDH after already being treated and told no more is required. Have we done something wrong or has the specialist? Although further treatment is uncommon, if DDH is diagnosed early and treatment is successful, there is the possibility of further treatment being required. This is not able to be predicted and is not due to the parent or specialist doing something wrong. Often, the need for further treatment for hip dysplasia / DDH is described as a 'regression'. This condition is defined by abnormal development or lack of growth of the hip joint; thinking of the need for further treatment in this context rather than as a regression can help. Unfortunately, sometimes the hip joint fails to continue to grow, at a rate in line with the rest of the body, once the initial treatment is deemed 'successful'. Some specialists are increasing the 'part-time' wearing of harnesses / braces in an attempt to reduce the potential for this outcome. Many specialists also schedule follow up reviews to check your child's hip joint is continuing to develop at an acceptable rate. I've been told swaddling can cause hip dysplasia. Should I not swaddle my newborn? 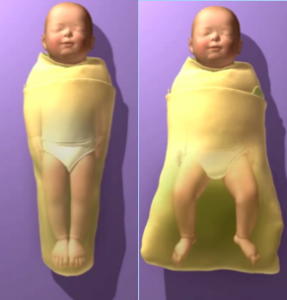 Swaddling, if done correctly, poses no risk to the integrity of the hip joint. Safe swaddling guidelines recommend that the legs be free to move into their natural frog-legged position. Please refer to the International Hip Dysplasia Institute position statement on safe swaddling for further information. Can hip dysplasia be corrected by Allied Health treatment only? No. These are complementary to treatment recommended by your specialist and should be discussed with your specialist. Why does everyone I’ve met on online support groups receive different treatments and recommendations — even when our child has a similar degree of severity? The diagnosis, treatment and management of hip dysplasia is a complex process involving many subtle differences which may not have been explained in full by your specialist. There are also several best-practice methods which guide a specialist's course of action and, depending on which they choose, may mean you follow a path different to someone in a similar situation. How am I meant to breastfeed my child during treatment? Adjusting how you hold and position your child to breastfeed during treatment can be overwhelming in the beginning. We have developed a tips & hints handout on this topic to hopefully give you some ideas to help make this adjustment period easier. Are standing play equipment, walkers and bouncers, such as the Jolly Jumper, bad for my child's hips? There is no evidence to suggest a link between use of these pieces of equipment and hip dysplasia. Short periods of use is recommended as opposed to prolonged periods of daily use. Please discuss further with your specialist for individual recommendations specific to your child. Your questions not answered here? Don't worry, the International Hip Dysplasia have more FAQ's you can explore. Keep updated about Healthy Hips news, events and resources. Disclaimer: This information is intended to support, not replace, discussion with your doctor or healthcare professionals. Every effort is made to ensure this information is up to date, accurate and easy to understand. Healthy Hips Australia accepts no responsibility for any inaccuracies, information perceived as misleading.